Everyone knows at least one person who decided on their current career when they were very young, is now happily working in that role and is very passionate about what they do. Why do some people know – and never waver from – what they want to “be” from an early age? Are you struggling, trying to figure out your best career fit even now after several years as a working adult? How do you know what is the right career for you? Get answers to these types of questions by joining Alan Kearns when he interviews Julie Clark, aerobatics pilot with a 30 year career as an airshow flying ace. Julie Clarke started her commercial flying career with Hughes Airwest as a 1st Officer on the DC-9 in 1976 and ended it in 2003 as a Northwest Airlines Airbus A320 Captain. She was one of the first female pilots to work for a major airline. 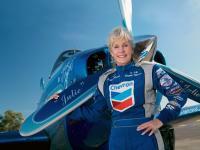 She has been voted Performer of the Year several times for her performance in air shows. Clark has 40 years of flight experience and has logged over 30,000 accident-free in the air. With her company, American Aerobatics, which she founded in 1980, she pilots a vintage aircraft in various air shows a year across North America.